Join us at Noon EDT for a day full of fun! 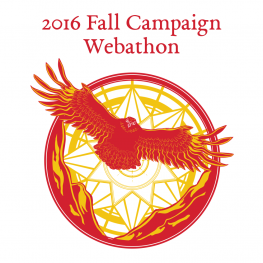 Our 2016 Fall Campaign Webathon will take place on Saturday, October 29 this year. Starting at 11:00 am EDT, Dr. Corey Olsen will serve as host to a variety of fun and exciting events taking place throughout the day. Come join for lots of fun and educational entertainment!